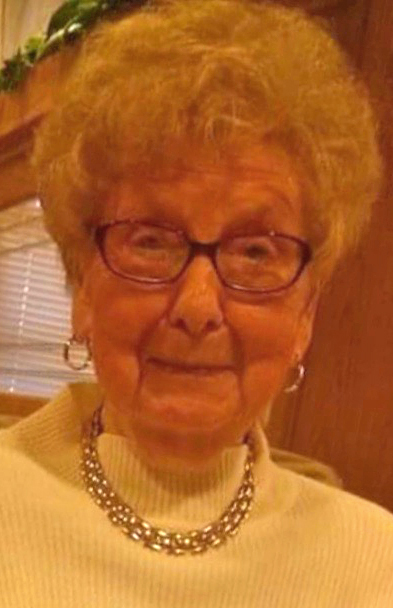 NEW MIDDLETOWN — Helen Mae (Mercer) Arnold, 95, of New Middletown, Ohio, formerly of Salem, Ohio passed away peacefully on Friday, February 15, 2019 at Masternick Memorial Nursing Home surrounded by her family. Helen was born in Butler Township on April 5, 1923, the daughter of the late Bert and Pearl (Stouffer) Mercer. Helen worked as a waitress for over 50 years, 25 of those years at Tippecanoe Country Club where she was dearly loved by the members. Her passion was ballroom dancing where she met the love of her life and companion for 44 years while dancing at Idora Park Ballroom. She enjoyed baking pies from scratch and was known for her delicious fudge. She loved having her family together and always looked forward to her family picnic in the campground at the Canfield Fair on Monday before the fair began. Helen is survived by her longtime companion John Poponyak; children Darla King of New Middletown and Rick (Susie) Arnold of Oracle, Arizona; grandchildren Kelly King, Jennifer (Doug) Moore, Lynette (Don) Rancourt, Todd Arnold and Johnny (Tabitha) Arnold; great-grandchildren Enslee King, Dayle Arnold, Delaney Arnold, Emma Arnold, Riley Arnold and Heidi Mae Moore who was born on her great-grandma’s 94th birthday; and several nieces and nephews. Besides her parents Helen was preceeded in death by a son, Lynn Arnold; brothers Chet, Orville, Herbert and Glenn Mercer; and sister Hazel Sneltzer. A funeral service will be held at 11 a.m. Tuesday, Feb. 19, 2019 at Zion Lutheran Church in New Middletown with Pastor Larry Klinker and Pastor Erin Burns officiating. Friends and family will be received from 5 to 8 p.m. Monday, Feb. 18, 2019 at the church and the hour prior to the service from 10 to 11 a.m. at the church. Interment will take place at North Georgetown Cemetery. The family would like to extend their heartfelt thanks to the staff of Masternick Memorial for the care they provided Helen. Also to Harbor Light Hospice for their loving care and compassion at the end. Memorial contributions can be made in Helen\’s name to Zion Lutheran Church, Attn: Memorial Fund, PO Box 434 New Middletown, Ohio 44442 or Junior Fair Advisory Committee Attn: Kim Moff, 10244 Berlin Station Rd. Berlin Center, Ohio 44401. Friends and family can view the obituary and sign the guest register online at www.brownfhonline.com.